If I asked you to give me the definition of a friend, how would you answer? Someone you can call in the middle of the night to help you solve your problems? Someone you can talk to and spread ugly rumors about a family member or co-worker? Someone who lets you borrow money and doesn’t mind if you don’t pay them back? However you define a friend, we ALL have at least one person or, in my case, several people we call friends who, in one way or another, add value to our lives and are there whenever we need them. This post is dedicated to all my friends, co-workers and family members who have helped me during my life and have helped me become the man I am today. As I’ve mentioned in a few posts, I was born with spina bifida and am in a wheelchair. Only my family and one of my very best friends knows this, but some days I get really frustrated because there are certain side effects I have because of the spina bifida that are beyond my control. One of those things I can’t control is that my legs sometimes get really tight and have muscle spasms that last from a few minutes to an hour in most cases. The spasms don’t really bother me because they usually happen when I am at home, but lately they’ve been occurring when I get ready to leave the house and go to work. My legs hit the steering column and make it hard to turn the steering wheel, which almost causes me to have an accident. This really makes me sad because I can’t help the spasms, and I’d probably be cited for causing the wreck, if I have one. I’ve emailed one of my co-workers, who is also my very best friend, a few times when I get the spasms because I was frustrated and sad, and just needed to talk to someone about it. She has been very supportive and has helped me see the bigger perspective, and I could never, ever repay her or thank her for her friendship. She’s reminded me on more than one occasion that my problems pale in comparison to the love God has for me, and everything will be okay if I will only learn to trust in Him and put all my faith in Christ to take care of my needs. One of the best parts about my job is that I am able to work on several big projects that will serve me well in the future because I get to work with several different departments in our organization and meet a LOT of very interesting, helpful people. A couple weeks ago, I updated a big three-panel display that is on the lobby level of my office. I may have mentioned this previously, but the display includes a map, pictures and a list of the major road, redevelopment and parks improvements around the city. The panels or “frames” the pictures, map and listing hang in are really heavy and are fastened to the display with screw-on knobs that are really, REALLY hard to get off sometimes. When I got ready to hang the pictures up, I had to ask a few of my co-workers for help because there was absolutely no way I would have been able to do it myself. Every time I ask my co-workers to help me with the display, they never complain and even ask if I need anything else after we are finished. It really makes me feel great knowing I have friends and co-workers who care about me and want me to be happy and successful in life and my job. I could never, EVER ask for greater friends and would not work anywhere else in the world. Before I go any further, I have to admit I am very proud of how independent I have become since I graduated high school and college, and it almost shames me to say I do have to ask for help when I need it. God bless my best friend, mentioned earlier in this post, she has always been there to remind me that everyone has disabilities and has to ask for help from time to time. She brings up a great point, and I guess I just forget that everyone needs help sometimes. I’ve been driving for about 10 years and am currently driving a 2007 Chevy (another true American original… I’m the other one!!! :)) van, adapted with hand controls for the gas and brake; a seat that turns around, goes up and down, forward and backward; and a wheelchair lift. I have not had much trouble with the van, but have noticed the past couple of years, when the weather gets hotter than about 75 degrees, that the lift won’t operate properly. I am able to open the lift doors (with a remote control, how cool :)), but the lift won’t even make a sound to act like it wants to open. I’ve tried to open it three or four times, and have even had to call my dad to come down and help a couple times. After about twenty minutes, we finally managed to get the lift to open, but it still acts funny every now and then. I know a couple times last year, when my dad was out of town, I had to get my supervisor and my best friend to come out and help me get in my van. God bless them both, having to get into a hot van, try to read the directions for how to operate the lift manually, trying their best for about 20 minutes until it FINALLY opens, and then staying with me to make sure I am able to get in and try to open and close the lift to make sure it works, then making sure the van actually cranks. After she finished setting up snacks and drinks, we walked down to my van, and together we got my lift out, and I was able to get in and go home. My best friend is such a sweetheart, and I owe her so much that I could never, EVER repay. I just hope she knows how much she means to me and how much I admire, respect and love her. She has always been there for me since she started working for our company, and I remember the very first time she was really there for me. A month or two after she started working for our company, in 2008, I got a phone call that my grandmother was in the hospital having some tests done, and my grandfather was trying to leave and drive himself home. The nurse said they couldn’t get in touch with my parents, and they were trying to get my grandfather to calm down and stay until someone got there. My grandfather had been diagnosed with Alzheimer’s and wasn’t allowed to drive anywhere, so I immediately got scared and had so many things running through my head… is my grandmother going to be okay? What’s wrong? Is my grandfather wandering around by himself, trying to drive? WHERE are my parents when we need them? I was so nervous, the only thing I could think of was to email my best friend and let her know what was going on. Within two minutes, she was down in my office, asking me questions, trying to help me examine the situation, asking if I’d called my parents (which I hadn’t in all the hysteria). She sat down and talked to me and told me that everything would be okay, and even let me cry on her shoulder for a few minutes. This really made me feel good inside and made me get on my knees and praise God for such amazing friends. I know I can say with complete certainty that I am a MUCH better man and person because of my friends, family and co-workers, and I would be so lost without them in my life. My hope and sincere prayer for this year, and for the rest of my life, is that I can be half the person my friends and family are. I’ve learned so much during my life from them, have learned to put things in the proper perspective, and know that everything will be okay if I just put my complete focus and faith in Christ to meet all of my needs. I want to make a promise to my friends, family and especially my co-workers right now. I promise with every fiber of my being to be there whenever you need me, to spend more time with you and to be the best co-worker/friend/son/brother/grandson/cousin/nephew I can be the rest of my life. I love and respect you all so much and could never, EVER thank you all enough for the friendship, love, support and help during my life. I am a better man from having known you. God bless you all. This poem is dedicated to my dear friend, Leslie Moon, who I met on Twitter a couple months ago, and to the men and women of the US military. We can learn so much from these brave souls who have gone through hell, fought the battles and have the scars to prove it. God bless you Leslie and God bless the United States of America. This past Saturday night, millions of people set their clocks ahead one hour before they went to sleep, which means we lost an hour of sleep. I’m not one to complain, but I could have really used that extra hour, especially after the past couple weeks at work. I shouldn’t really say that because I’m usually always tired, maybe because I’m always sitting in my wheelchair and can’t get up to stretch my legs or “get the blood flowing again,” as people like to say. Another way I feel the effects of the time change is with my family. I don’t really spend a lot of time with my parents and two sisters because I put in so much time at the office, but whenever I get to spend a few minutes with them, it really makes me feel good inside. Whenever we lose an hour, I feel like I’m losing that precious time with family because it seems like I get home, tell my mom about my day, eat something if I’m hungry, and before I know it, it’s 9 p.m. and time for me to go to bed. I remember last week I was really beat after work a couple days and even came home and went to bed about 7:30. I must have really needed that sleep because I woke up refreshed, ready to face the world again and take on more challenges. Now, since we lost 60 minutes of our day, I feel like I need to get in bed at 6 p.m. to make up for the 3,600 seconds we lost to Father Time. But like I said, I’m not complaining because losing an hour of my day will only serve to make me stronger because I’ll have to buckle down, set priorities and work harder to meet deadlines. I’ll also have to make sure I don’t ruin my relationship with my friends and family by making sure I make the most of the time I spend with them. I also want to make sure they get the most out of the time they spend with me, by not fussing when something is not going my way, always having a smile on my face and always asking if there is anything they need or anything I can do for them. As I close, let me ask you a question. How does the time change affect your daily routine and your relationships with those you love? Are you making the most out of your time with friends and loved ones? Are you doing everything you can to be the most productive employee at your office? Are you taking enough time for yourself, to unwind and re-energize your mind, body and spirit? Growing up, one of the biggest dreams I had was getting my driver’s license, so I could drive myself wherever I need to go and wouldn’t have to rely solely on my parents to take me everywhere. Not taking anything away from my parents, but as you can imagine, having your dad drive you to college or work, picking you up, sitting you in your wheelchair and telling you goodbye can kind of be embarrassing. Fortunately I have THE greatest parents in the world who let me have the freedom to drive myself wherever I need to go, whether it’s to work, the store or to get something to eat if I’m hungry. Ok, good that little detour is over with, now I can get back to the topic at hand. 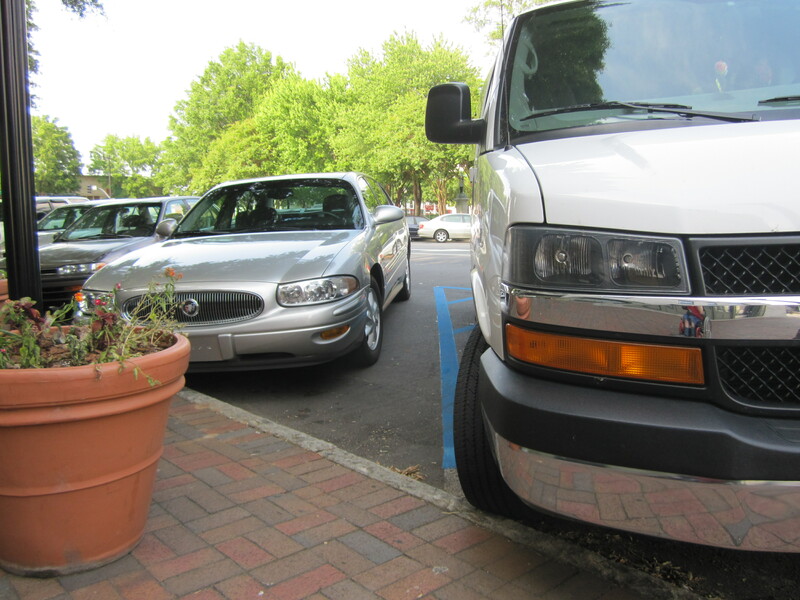 I’ve been driving for about 10 years and whenever I am out, I am always watching for parking violators or other things that prevent me from getting out of my van or going into a store. I remember about 10 or 15 years ago my family and I were going to Tennessee and we stopped at a K-Mart by the interstate so we could stretch our legs. Which is amazing isn’t it? Mom, dad and my sisters get out to stretch THEIR legs, and here I am, can’t even stand up… but I’m not complaining one bit, because I know God put me on this Earth for a purpose and to bless people with my amazing story of courage and hope. 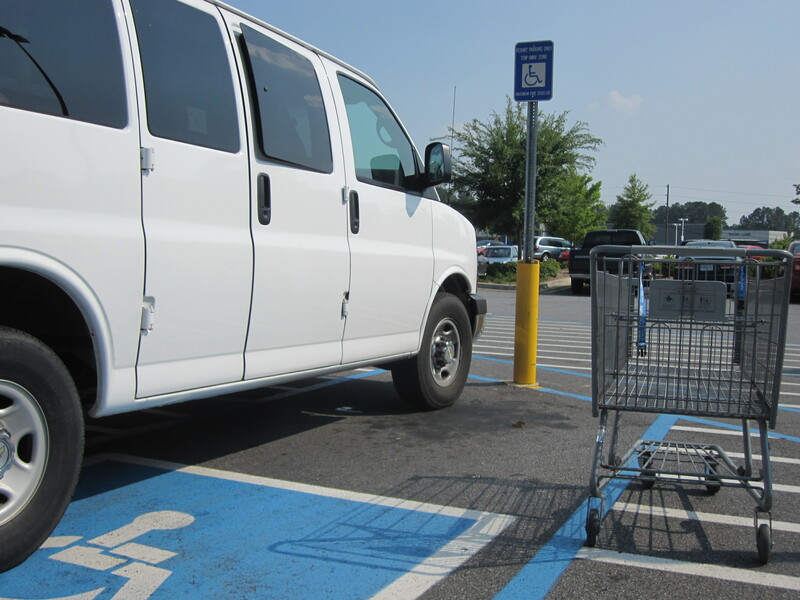 Anyway, when we got out of K-Mart, and got ready to get back in the van, I couldn’t because someone parked in the “Expectant Mother” parking spot, right where I needed to let my lift down. Dad was furious, got the license plate number and went back in and had the driver paged to come move their car. When they came out and saw me sitting there, they had this look of pity on their face, like “Oh, I’m sorry.” Dad told them that only expectant mothers could park there, and the woman said, “Oh that’s not a law,” got in her car and drove off. I can’t tell you how mad we were, especially my dad. It just breaks my heart knowing that people don’t even care about people who NEED these spots. I remember another time I was getting out of class and got ready to get in my van, and basically the same thing happened. Someone parked in the loading zone, right next to my lift and I had to wait until they came back out. I saw them getting out and told them to move, and they just blew me off and said, “I’ll just be a minute.” When they came back out, I opened my lift RIGHT in front of them, so they could SEE how utterly STUPID they were to park there. If it’d been raining, I would have been soaked to the skin and had to drive an hour home in wet clothes. You know, I just wish people would get their heads out of their butts and actually put themselves in my position one day. How the heck would you feel if you were disabled, in a wheelchair and not even be able to get in your car because some dumb idiot who cares only about themselves parked in the spot you need? PLEASE just open your eyes and get your heads out of the dang clouds and realize we are people too, who want to be a welcome part of society. Before I go, there’s another thing that really grinds on my nerves, and if you know someone with a disability, you can probably relate big time. 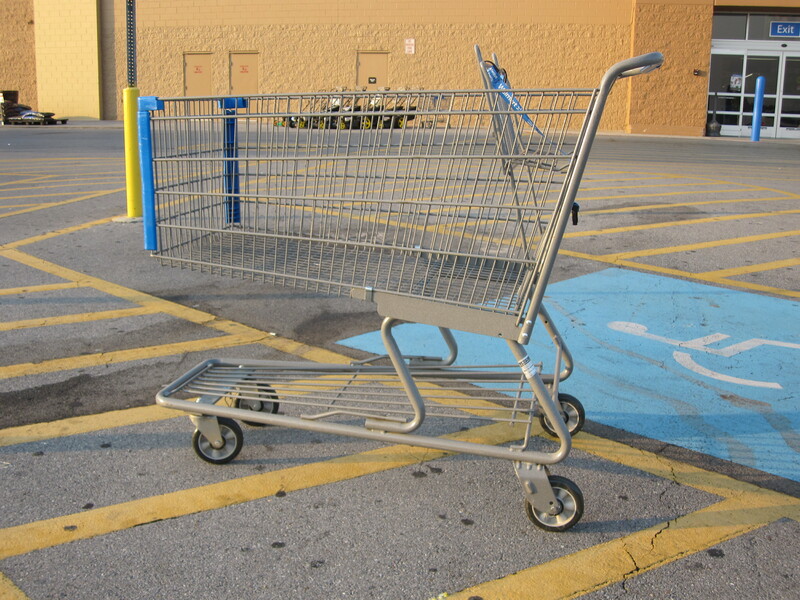 I was at Wal-Mart the other day and I found a spot right in front (one of the advantages of getting there at 8 a.m. :)). As I was getting out, I looked across the aisle and saw something that almost made me blow up. Someone had apparently finished shopping, put their groceries in their car and left the shopping cart in the HANDICAPPED spot!!! 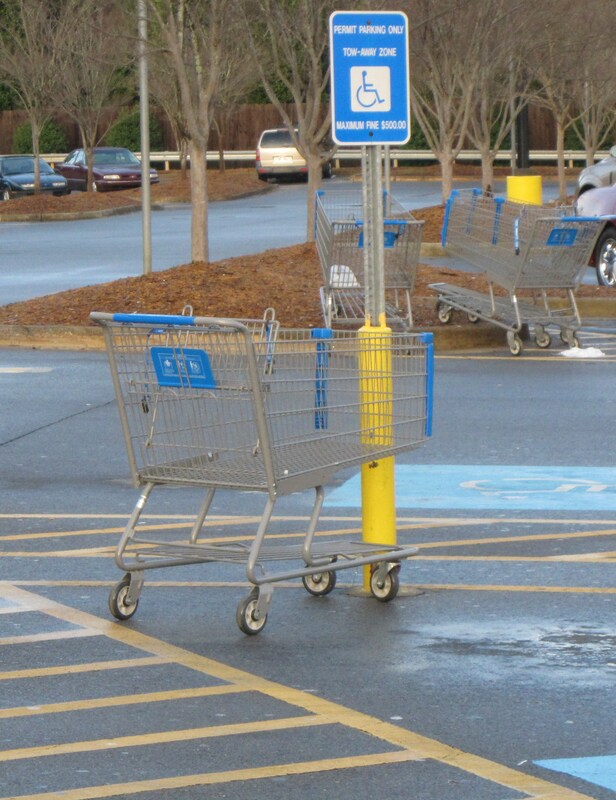 Let me tell you, nothing ticks me off more than knowing people are so LAZY they can’t even walk the cart back in the store, or put them back in the little corrals that say “Return Carts Here.” It’s not going to hurt you to spend a few extra seconds to put the carts back where they belong. As I close, I hope I haven’t offended anyone by this post. I just want people to understand how frustrating and sad it is knowing people don’t even care about disabled citizens. We are part of society just as much, if not more, than everybody else is. 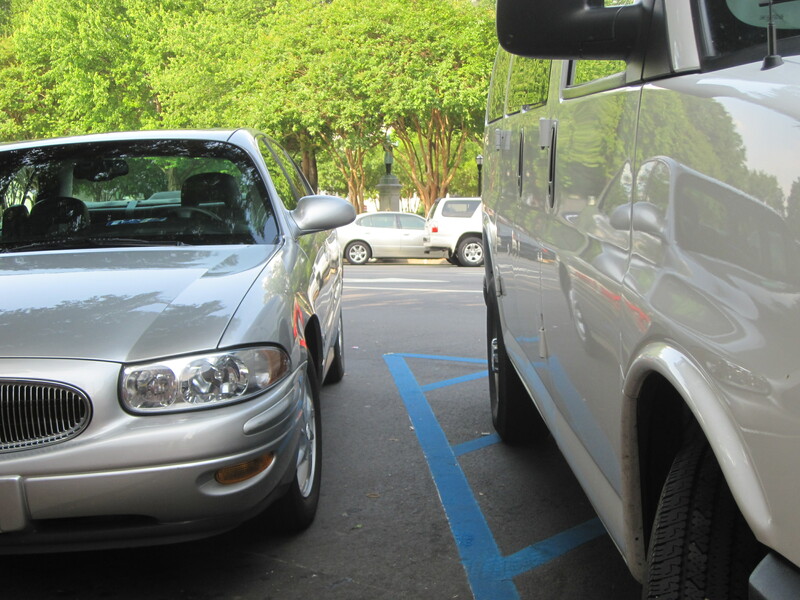 I just want you to know how much it breaks my heart knowing people abuse the handicapped parking spaces and cause those of us who need them to have to go out of our way to park. Let me just give you a word of warning. I’ll be watching for parking violators everywhere I go, and you never know when I’ll have a pad and pen handy to write down your tag number, make and model of your vehicle. I will make sure this crap stops immediately and that handicapped citizens have equal right to a parking space wherever they go. I am SO dang sick and tired of being looked down upon and forced to change my plans because some people can’t get their heads out of their butts and realize WE ARE PEOPLE TOO. If there’s one thing I love, it’s eating. I’m keeping this one short and sweet because dinner’s cooking, but, in no particular order are my top twelve favorite foods of all time.